Jaundice is a yellow discoloration of the skin, mucus membranes, and whites of the eyes. Jaundice is caused by an excess of bilirubin in the blood. Bilirubin is a yellow-brown colored substance in bile. 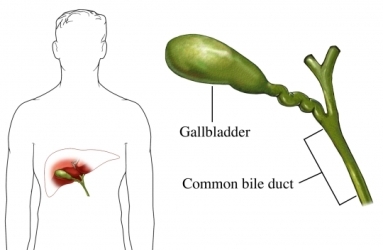 Bile is a liquid that carries waste products and bilirubin away from the liver. It also helps break down fats in the small intestine. It is formed during the body's normal process of breaking down red blood cells. Mild jaundice in newborns is common and usually clears without treatment. If bilirubin levels rise above a certain level, the baby may receive phototherapy , which is treatment with a special ultraviolet light. In Gilbert syndrome, jaundice tends to clear without treatment. Drink alcohol in moderation. Moderation is no more than 2 drinks per day for men or 1 drink per day for women. Be careful mixing alcohol with other medications such as acetaminophen . To decrease your risk of hepatitis A, get the hepatitis A vaccine . To decrease your risk of hepatitis B, get the hepatitis B vaccine . Abnormal liver function tests—approach to the patient. EBSCO DynaMed Plus website. Available at: http://www.dynamed.com/topics/dmp~AN~T316452/Abnormal-liver-function-tests-approach-to-the-patient . Updated February 19, 2018. Accessed April 4, 2018. Bilirubin. Lab Tests Online—American Association for Clinical Chemistry website. Available at: https://labtestsonline.org/tests/bilirubin. Updated April 4, 2018. Accessed April 4, 2018. Neonatal hyperbilirubinemia. EBSCO DynaMed Plus website. Available at: http://www.dynamed.com/topics/dmp~AN~T116718/Neonatal-hyperbilirubinemia . Updated July 31, 2017. Accessed April 4, 2018.